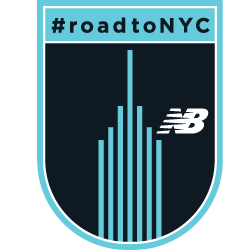 Sunday, November 4th is the 2018 TCS New York City Marathon, and New Balance wants to celebrate with you this October and November. Whether you're in Boston, Buenos Aires, Berlin, Bangkok, or anywhere in between, it's time to lace up your shoes and get running. New Balance is challenging you to run 26.2 cumulative miles in two weeks to cover the full distance of the TCS New York City Marathon. All athletes who complete the challenge will win a badge for their digital trophy case. Looking for more ways to connect with the event? Use the hashtag #RoadToNYC in your activity title during the challenge to show your excitement for the 2018 TCS New York City Marathon. To learn more about New Balance please visit their website and join their Strava Club. Now put on those running shoes, enjoy the nice weather, and celebrate the 2018 TCS New York City Marathon with New Balance! And don't forget to check out the TCS New York City Marathon Virtual - 5K. Those Ks will count on your #RoadToNYC. Run 26.2 total miles in two weeks to win a digital badge. Use #RoadToNYC to celebrate the race! The content in this challenge is the sole expression of New Balance. To learn more about how to use Strava, please visit the Strava Support Center or email support@strava.com. All other inquiries should be directed to New Balance. The Empire State Building Image® is a registered trademark of the ESRT Empire State Building L.L.C and is used with permission.